George W. Bush in 2000, John Kerry in 2004, John McCain in 2008  though the nominees change, the quadrennial promise to shift the American embassy in Israel to the country's capital has been as consistent as Old Faithful. Washington has never formally recognized Jerusalem as Israel's capital. When asked what the country's capital is, administration spokesmen tie themselves in knots to avoid giving an answer. This isn't just an absurdity, it's an insult to an ally. It's also a continuing act of appeasement to rejectionists who oppose Jewish sovereignty over any part of the Jewish homeland. 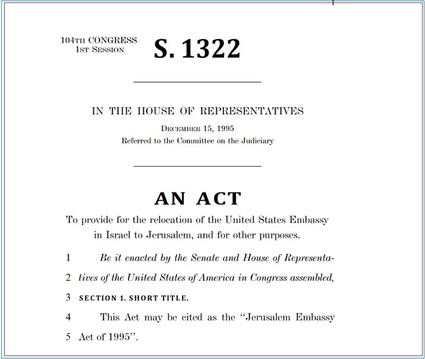 Such discriminatory treatment is obnoxious; that is why presidential hopefuls keep pledging to fix it, and why the House and Senate more than a decade ago, by overwhelming majorities, passed a law  the Jerusalem Embassy Act of 1995  requiring that the embassy be moved. When pressed, the White House or State Department says that relocating the embassy would amount to prejudging an issue that should be settled through negotiation. That might be plausible if the US embassy were to be established in eastern Jerusalem  which was occupied by Jordan from 1948 until Israel liberated it in the Six Day War. But no one has ever suggested that the embassy go anywhere but West Jerusalem, the undisputed seat of Israel's government since 1948.